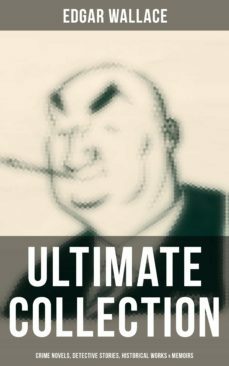 Musaicum Press presents to you an ultimate Edgar Wallace collection, formatted to the highest digital standard and adjusted for readability on all devices. This meticulously edited collection contains over 90 crime novels, including famous action adventure series, short stories, true crime tales and much more from incomparable Edgar Wallace: Edgar Wallace — Each Way (Biography) Screenplay: King Kong True Crime Stories: The Secret of the Moat Farm The Murder on Yarmouth Sands The Great Bank of England Frauds The Trial of the Seddons Herbert Armstrong - Poisoner The Suburban Lothario Crime Novels: Angel Esquire The Fourth Plague or Red Hand Grey Timothy or Pallard the Punter The Man who Bought London The Melody of Death A Debt Discharged The Tomb of TSin The Secret House The Clue of the Twisted Candle Down under Donovan The Man who Knew The Green Rust Kate Plus Ten The Daffodil Murder Jack OJudgment The Angel of Terror The Crimson Circle Take-A-Chance Anderson The Valley of Ghosts Captains of Souls The Clue of the New Pin… The Green Archer The Missing Million The Croakers Double Dan The Face in the Night The Sinister Man The Three Oak Mystery The Blue Hand or Beyond Recall The Daughters of the Night The Ringer Detective Sgt. Elk Series: The Nine Bears Silinski - Master Criminal The Fellowship of the Frog The Joker The Twister The India-Rubber Men White Face P.-C. Lee Series Four Just Men Series: The Four Just Men The Council of Justice The Just Men of Cordova The Law of the Four Just Men The Three Just Men Again the Three Just Men The Earl of Nowhere Series African Novels: Sanders of the River The People of the River The River of Stars Bosambo of the River Bones The Keepers of the Kings Peace Lieutenant Bones Bones in London Sandi the Kingmaker Bones of the River Sanders Again Sanders Mr. J. G. Reeder Series: Room 13 The Mind of Mr. J. G.